Male (left) and female (right) specimens of Selidosema suavis, from here. 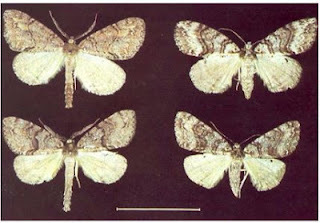 The Selidosemidae is a cosmopolitan family of moths. Characters (from Meyrick 1895): Imago with body slender to rather stout, forewings broad to rather elongate, triangular; hindwings with vein 5 imperfect (not tubular) or obsolete, 6 and 7 usually separate, 8 usually obsoletely connected with upper margin of cell near base, approximated to near middle. Posterior tibiae of male often enlarged and enclosing an expansible tuft of hairs. Ovum subcylindrical or elongate-ovate, more or less reticulated, sometimes ribbed. Larva elongate, more or less slender, with few hairs, without developed prolegs on 7, 8 and usually 9; often remarkably like a twig of its food-plant. Pupa subterranean or in a slight cocoon above ground. Meyrick, E. 1895. A Handbook of British Lepidoptera. Macmillan and Co.: London. [P27] Philpott, A. 1927. New Zealand Lepidoptera: Notes and descriptions. Transactions and Proceedings of the New Zealand Institute 57: 703-709.